This is a partial transcript from On the Record with Greta Van Susteren, April 29, 2003. Click here to order the entire transcript of the show. Watch On the Record every weeknight at 10 p.m. ET. JACKIE PETERSON, SCOTT PETERSON'S MOTHER: Laci called me mom. She was like a daughter to me. We miss her, and we love her, and, you know, someone out there did this, and they're still loose. LEE PETERSON, SCOTT PETERSON'S FATHER: Someone took Laci and her -- and the baby's life, and we're going to find them. VAN SUSTEREN: Our next guest says she was hired by Scott Peterson's mother to help find her daughter-in-law Laci. And, in March, weeks before Laci and her son were found, our guest delivered her conclusion to the Petersons and the Modesto police. 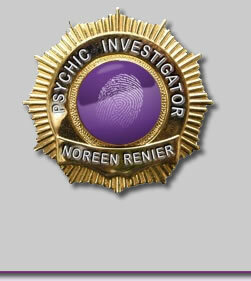 Joining us in Gainesville, Florida, is psychic investigator Noreen Renier. 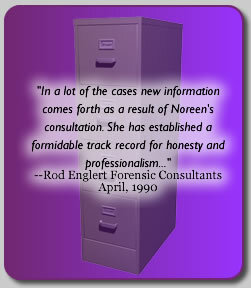 NOREEN RENIER, PSYCHIC INVESTIGATOR: Thank you. VAN SUSTEREN: Noreen, when were you hired by Scott's parents? VAN SUSTEREN: And -- and did you actually go out to California and meet them? RENIER: No, I really don't travel. I usually have items from the -- either the homicide -- from the body or the missing person sent to me. VAN SUSTEREN: Did you have conversations with Mr. and Mrs. Peterson? RENIER: I had two or three conversations with Jackie Peterson, and I spoke to Scott Peterson once. VAN SUSTEREN: And, in terms of the investigation of what you do, your investigations, you had them send you some things, didn't you? RENIER: Yes, I did. I'm a psychomotrist, which means I touch items and get vibrations, energies from the items. VAN SUSTEREN: All right. Can you show us -- did you bring those items tonight of what it is the Petersons -- now did Scott send this to you, or did Scott's mother, Jackie, send this to you? RENIER: I had two packages. The first package -- they sent me this sweatshirt. VAN SUSTEREN: And can you hold that up. That -- and that -- whose sweatshirt is that -- Scott's or Laci's? VAN SUSTEREN: All right. And -- OK. So that's the sweatshirt. What else did they send you of Laci's? RENIER: All right. Well, when I got this, I didn't feel like it was enough of her energy into it. It was too clean, and -- so I asked for them to send me something else, and they sent me a shoe. VAN SUSTEREN: Just one single shoe. RENIER: One single shoe that doesn't look like it's been worn really that much. VAN SUSTEREN: How do you know that's even Laci's, that it isn't sort of a hoax that -- I mean what gives you -- you know, how do you know that? RENIER: I guess I'm terribly trusting. I really thought it was hers, and it worked. If it was hers or the next-door neighbors, my mind thought it was hers, and it worked. VAN SUSTEREN: All right. And what else did they send you? RENIER: Those were the only two items. VAN SUSTEREN: All right. So was it -- they were sent in an envelope. Is that right? RENIER: That's correct. One came in a -- more of a box, and then the second item came into something like this. VAN SUSTEREN: OK. All right. Now what did -- in your conversation with Scott -- first of all, did you place the conversation to -- the call to Scott, or did he call you? RENIER: I had called Jackie to tell her that the sweatshirt wasn't going to be enough, I needed something more, and when I -- her answering machine came on, and, as I started speaking, Scott picked up the phone. VAN SUSTEREN: And what -- what was your conversation with Scott? RENIER: It was very brief. He said very little. I could just sort of feel like a protective shield all around him. He said very little. I just said I needed something more that had more of Laci involved in it, and that's when he sent me the shoe. VAN SUSTEREN: OK. So he knew that you were doing this, that his mother had hired you? RENIER: I'm assuming so, yes. VAN SUSTEREN: All right. I mean did he give you any other information about Laci? RENIER: Nothing. He really said nothing except, yes, we'll send you a shoe. VAN SUSTEREN: All right. So -- so, apparently, he had -- I mean your assumption was he knew something of -- that his mother hired you? RENIER: Right. Absolutely, yes, because he didn't have to pick up the phone. I was on the machine leaving a message. VAN SUSTEREN: All right. So what is it you did and what did you determine as a result of your psychic investigation? RENIER: Well, basically, they hired me to -- Jackie Peterson hired me to find Laci, and that's what I wanted to do. Unfortunately, in the very early part of it, I saw some other things, and then I tried to focus back into directions and where I saw her and what I could describe around her so that people could find her. VAN SUSTEREN: Did you report this back to the Petersons? VAN SUSTEREN: All right. Let -- we only have a minute left. So just in a minute left, what did you conclude had happened? What -- and what did you convey to the Modesto police and the Petersons? RENIER: I sent them my typed transcripts, which gave information about what I saw, the rocks, the park, the bridge, the bumpy road, a bunch of numbers. I was trying to get longitude and latitude -- or map coordinations for them as well. I don't remember all. It was quite a bit of sessions. But a lot of information. VAN SUSTEREN: In any of -- did it involve whether or not Scott did murder his wife or not murder his wife? RENIER: Oh, I didn't want to see who killed Laci. I knew she was dead when I started on the case, and I didn't really want to see that, but it just sort of popped up right in the beginning, and I sort of pushed it back because I was horrified at what I was seeing, and I didn't want to see that. But I saw someone, a male, hitting her on the head, and I could see a door there, and I knew that a rug was missing, and, also, whatever he hit her with on the head, of course, was missing as well. VAN SUSTEREN: All right. Let me just -- one quick question then we've got to go. Did you tell the Petersons that, and did you tell the police that? RENIER: I didn't tell the Petersons that, but I did give the whole report to the police. VAN SUSTEREN: All right. Noreen, thank you. I appreciate you joining us tonight. RENIER: Thank you very much for having me. Click here to order the entire transcript of the April 29 edition of On the Record.